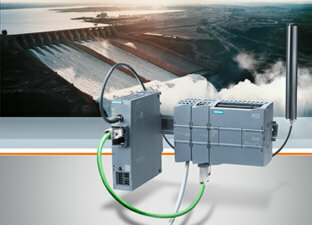 July 13, 2015 + + + With the new CP 1243-8 IRC communication processor, Siemens enables telecontrol applications based on the Sinaut ST7 telecontrol protocol. The new communication processor makes it possible to connect Simatic S7-1200 controllers as outstations (remote terminal units/RTUs) to higher-level ST7 stations with minimum effort and low costs. The solution is suitable for use in new and existing systems. Redundancy and comprehensive security functions ensure high availability and security. Key applications for the CP 1243-8 IRC are distributed plants in the fields of drinking water supply and distribution, sewer networks, and rain overflow tanks. In addition, the communication processors can be used for environmental monitoring and as local transport and distribution grids for district heating and electrical energy networks. Connected RTUs are contacted via public or private communications networks. An industrial router (such as those in the Siemens Scalance M product range) can be connected to the Ethernet port of the device to establish an internet or cell phone connection. Additional connections for analog dial-up or private wireless network can be established via separate modules. The CP 1243-8 supports both cyclical and event-driven transmission of every type of data required for process control and also offers alarm functions. The device can transmit measurement values from outstations to control centers or higher-level stations and send automatic e-mails and text messages to maintenance personnel. In order to prevent data loss in the event of a dropped connection, the communication processor continuously saves time-stamped measurement values. As soon as the connection is reestablished, the buffered values are automatically transmitted in the correct historical sequence to the control center. To improve availability, the CP 1243-8 IRC offers the option of establishing an additional connection via the second WAN interface (for route redundancy). For this, a so-called teleservice (TS) module – for instance, an RS 232 serial interface or dial-up modem (analog, ISDN, and GSM) – is connected to the second WAN interface. Users can operate with one or the other interface, or both simultaneously. Comprehensive diagnostic options – either locally via error messages by LED display, in the Simatic Step 7 engineering tool, or through a web server – offer fast and highly informative analyses of the station status. This enables users to quickly and easily configure connections to new modules with data-point configuration in Step 7. In the Step 7 Professional engineering software in the TIA portal, the user simply selects the data to be transferred from the Simatic S7-1200 CPU and specifies the desired communication parameters. In addition, the new communication processor is equipped with comprehensive security features such as firewall (stateful inspection) and VPN protocol.